If you use the Safari web browser on a Mac and want to export references from Library Search to Endnote Online there are a couple of extra steps. 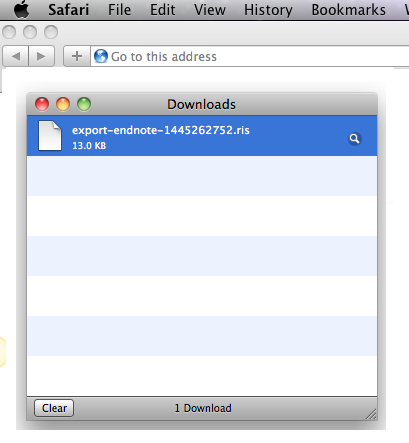 Download box opens (screenshot below) telling you the name of the file eg export-endnote123455.ris (you may just get a blank screen, the file will still probably have gone into your downloads, so you can still do the next steps). Then choose whether to add the references to a particular group or to the Unfiled area in your library. A message in red appears confirming your results are added to your EndNote Online library and can now be used for referencing.